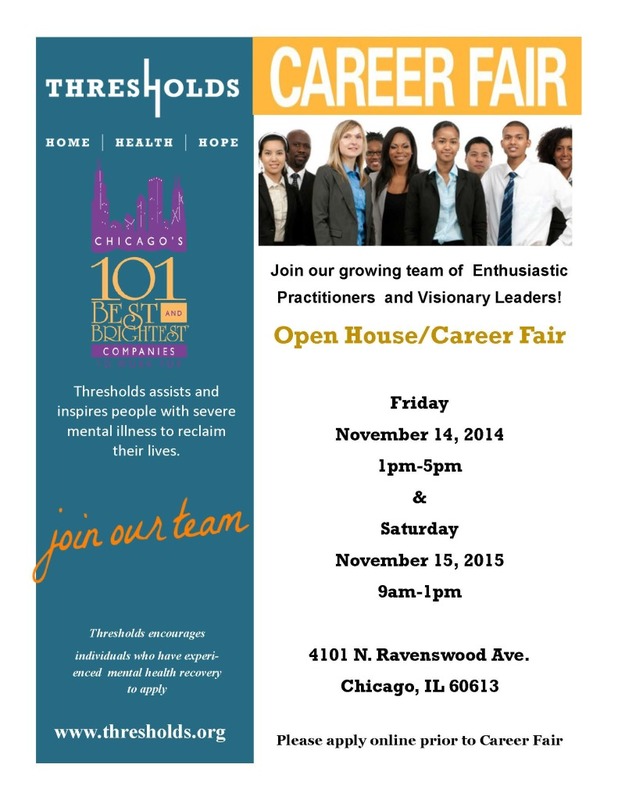 Thresholds Named to Chicago Tribune Top 100 Workplaces THRESHOLDS VETERANS PROJECT RECIEVES NATIONAL AWARDS FROM CALL OF DUTY ENDOWMENT Join us for an Open House Career Fair! Friday, November 14 from 1 p.m. -5 p.m.
Saturday November 15, 2014 from 9 a.m.-1 p.m. Both events will be held at 4101 N. Ravenswood Ave, Chicago, IL 60613. We are especially seeking licensed candidates (LCPC, LCSW, LPHA), and those with Mental Health experience. We have available positions in Chicago (South, North, & West), Kankakee, and McHenry County. Our current openings can be viewed at www.thresholds.org/careers. Individuals who have experienced mental health recovery are also encouraged to apply. Please share this exciting event with your networks! This entry was posted in Community Event, News and tagged Careers, community, job fair, mental health. Bookmark the permalink.